Okay—so they eventually stop–when the book hits the shelves. I’m neck deep in a heavily-noted revision at the moment, so naturally that’s what’s on my mind. Readers may be surprised to discover published books go through several rounds of editing before they hit the local bookshelves. At Harlequin Love Inspired, the author is part of three of those edits, with a fourth and final proofreading. Other houses and indie publishers may have different schedules, but here’s a peek into mine. First is the dreaded R word—revisions. This is the toughest part for me. I’ve been writing long enough where I often don’t hit this stage, but once in a while, like now, certain plot points or goals/motivations/conflicts are off the mark of what the editor wanted to see, and in a sense, it’s back to the drawing board, not starting from scratch, but working with the finished product to make it shine. Rub on, rub off. Buff, buff, buff. Scrub. Polish. Take a breath. Buff some more. Next are the line and copy edits. At Harlequin, these are usually done at the same time, but by different editors (my editor does the copy editing and they freelance out the line editing.) Copy editing is another substantive, thorough edit, addressing any smaller plot holes or inconsistencies. The line editor is the grammar expert and timeline checker. The last part that the author sees are the galleys, also called author alterations. This is the formatted book. At this point changes are minimal. I’m only looking for major errors and typos. I like to send this version to my Kindle so I can read it like a book. Yeah, I know. It is a book. But after I’ve worked through the manuscript so many times, my eyes skip over mistakes, and I catch errors better if I’m reading on my Kindle. The next time I see my manuscript, it’s in the box of author copies that the nice guy in the brown uniform delivers to my front porch, and then on the shelf at Walmart, all polished and pretty with its cowboy/baby cover. 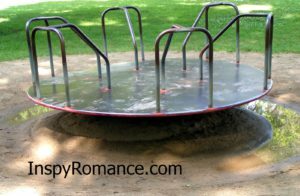 And I can hop off the merry-go-round and reorient my poor, dizzy head. Deb Kastner’s next novel is The Cowboy’s Baby Blessing, out June 20th. It certainly can make you dizzy. Good luck with the revisions, Deb! Thanks for sharing your process and good luck with revisions. Thanks for sharing and best wishes with the revisions. 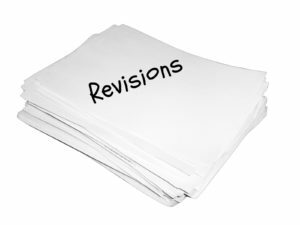 As a retired high school English teacher, I know how difficult revisions were for my students. I also know that even writing posts with spell check, so often our eye corrects the mistakes on the page. Editors and review teams are extra eyes to the author. Enjoy your day. Thanks for giving us a peek behind the scenes. As a “new” Harlequin author, I still don’t fully understand the process. Your post clarified a few things for me. I did just work my way through an intense round of revisions, so I’m sending virtual hugs and chocolate. :-) Love the new cover, by the way. No wonder your head is spinning, Deb! I’m at the stage of waiting to heard back from Love Inspired, hoping and praying I made enough changes this time around for them to contract the book! Good luck. Hope you’re able to work your way through the revisions quickly. I know how easy it is for me to read over mistakes in something as short as an email, so I can only imagine what it must be like to try and catch mistakes in your book since you are so familiar with it. Thanks for the peek behind the Love Inspired curtain, Deb! And congrats on your upcoming release. That’s a sweet-looking cover! Just reading what’s happens in the process makes me dizzy 😊Thanks for sharing the excitement of bringing a book to life. Very interesting, Deb! It’s a long process to get a book polished up and published. Thanks for sharing! Sounds like a very time consuming process, but I’m so thankful for all of you authors who push through so we can have good quality books to read. Love the cover, though I do love horses so they’ll always get my attention.